Iya Ope’s death adds to the list of recurrent tragedies disproportionately affecting women and children in Badia-East community (in Apapa Local Government Area of Lagos) following the September 2015 demolitions and forced evictions of homes and businesses in the area. Bulldozers operated by Lagos State officials, in connivance with a private family, flattened Badia East community on 18- 22 September 2015. Consequently, thousands of families were rendered homeless at the peak of torrential rainfall, leaving scores of women, children and men to sleep under makeshift shelters at the demolition site. More than a year later, death and despair continues to haunt the displaced residents, especially the women and children. Hundreds still sleep in the open. Many are either sick or have died from excessive exposure to cold, unsanitary conditions, mosquitoes and other environmental hazards. That was the fate that befell “Iya Ope” who died on November 10, 2016, leaving behind an 18-month old baby. Before her death, she looked malnourished and sickly. She had been sleeping in the open since September 2015 when her home was demolished. Weeks before her death, a middle-aged man, sleeping in an abandoned bus, was found dead. He left behind 6 children and a wife. Iya Ope’s death is a sad reminder of the May 12, 2016 container incident in the community that killed one and injured many. On the morning of May 12, 2016, three out of a stack of six containers belonging to a maritime organization, Sifax Group Ltd, fell on some makeshift homes sheltering persons forcefully evicted from the community in September, 2015. The containers caused the untimely death of a lady named Ms. Ngozika. “Many more are silently dying of frustration”, Mr. Sehinde, the Badia community youth leader told SPACES FOR CHANGE. ” How many more needs to die before the government can act?”, he asked. 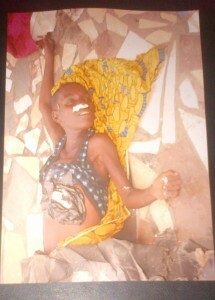 Residents invited the local council to take Iya Ope’s corpse away. “We had to pay them before they could remove the corpses”, Ms. Ibukun told SPACES FOR CHANGE. Council officials helped to fumigate the area after taking the dead bodies away. 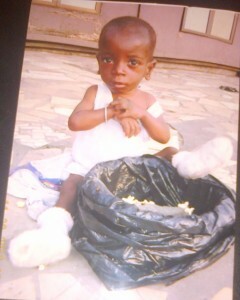 Iya Ope’s baby has been taken to a local orphanage. These continuing deaths constitute a violation of the residents’ human rights, especially the right to housing. What do we mean by the right to housing? The Committee on Economic, Social and Cultural Rights (CESCR) proffered the most authoritative interpretation of the right to housing. It cautioned that “the right to housing should not be interpreted in a narrow or restrictive sense which equates it with, for example, the shelter provided by merely having a roof over one’s head or views shelter exclusively as a commodity. Rather, it should be seen as the right to live somewhere in security, peace and dignity”. Everyone is entitled to this right, irrespective of income or access to economic resources.